Weather Data from the Bridge: Wind 12 knots, 005*, Seas 1-3 foot swells, Visibility – unlimited!! NOAA has a unique relationship with the shipping industry. Ships are traditionally built with specific uses in mind. 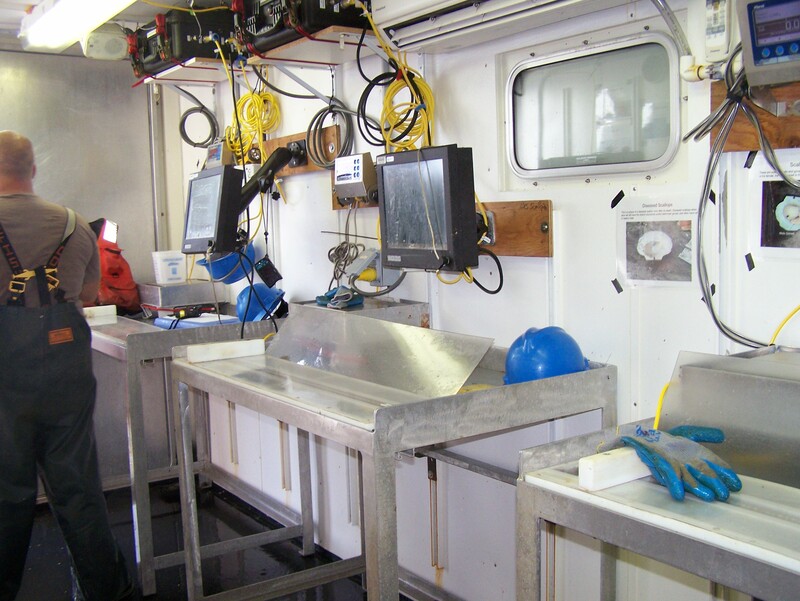 The R/V Hugh R. Sharp is owned by the University of Delaware and was completed in 2006 as a state-of-the-art research vessel. Marine architects and engineers designed mechanical and electronic systems to launch scallop dredges, the HabCam, and the CTD (conductivity, temperature, and depth) scanner. The ship can accommodate 9 crew members and 12 science staff members. The University leases the vessel to the NOAA scientific crew for specific missions or surveys. Each year NOAA sets up research surveys to collect data concerning many aspects of the fishing industry along with studies centered around conservation. The sea scallop survey is one such research project which has been a yearly event since 1977. 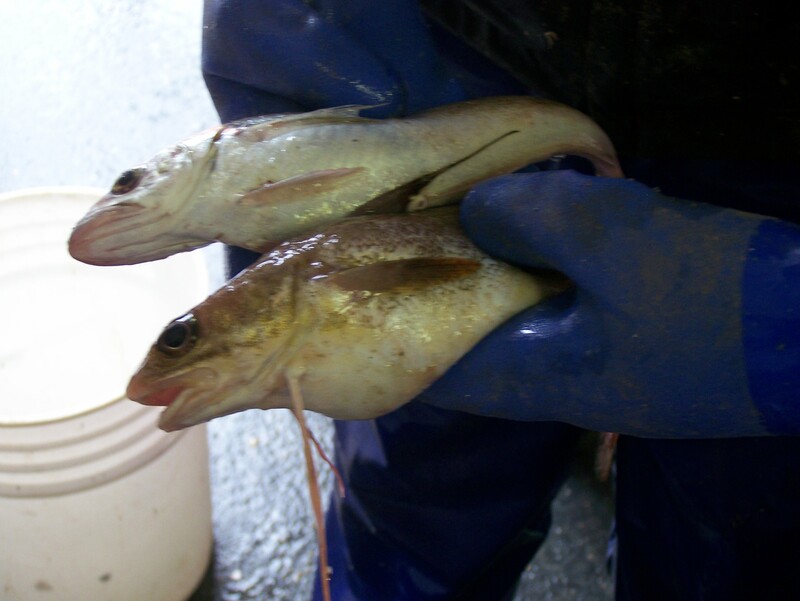 It began as a bottom trawling event taking place for several legs (mission time periods) between May and July. Sea scallops are a bivalve subgroup of mollusks. 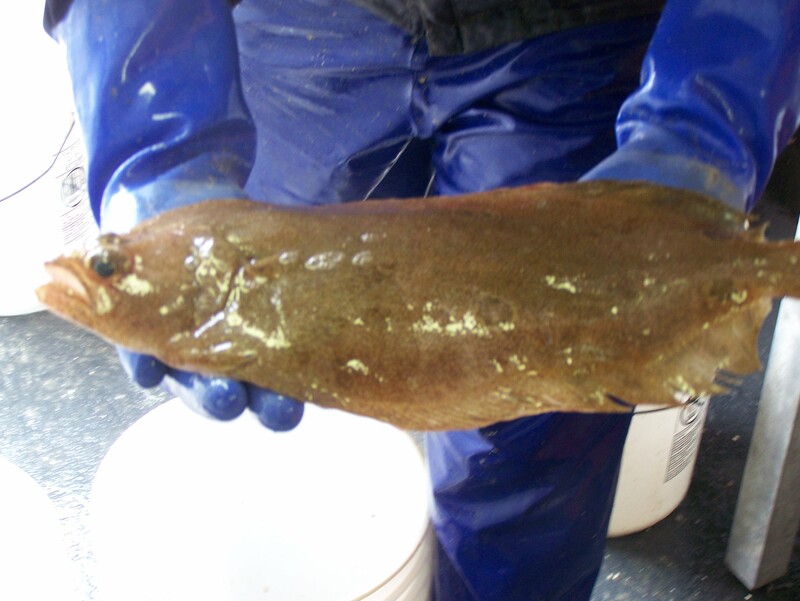 They take years to mature to a size that is sought after by fishermen. As with any species, overfishing is a major concern. Ideally, a species’ survival is dependent upon a consistent population. The Northeast Fisheries Association determines the scope and location of “open” fishing areas for all species of fish and shellfish. NOAA is called upon to collect data concerning the abundance or lack of scallops in a traditionally rich fishing locale or in a closed area. 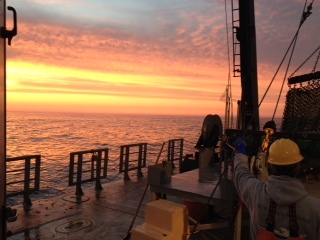 During our leg of the survey, we collected data using the HabCam as well as towing a scallop dredge. A map of the fishing locations is analyzed to determine the dredge or HabCam areas that are to be investigated. 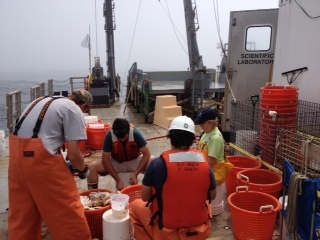 Each dredge “catch” contained a variety of marine species with the inclusion or exclusion of scallops. At one event, we hauled in 16 baskets of baby scallops. These were an encouraging sign that the scallop population is prolific. At other times, no scallops were present but there was a bumper crop of sand dollars. This was because the area that they were collected is considered an “open” scallop fishing area. The range in size of the scallops that were brought in varied between 55 and 155 mm? Carol prepares to sort the dredge. Data collection inside the wet lab of the Sharp. Yesterday we completed our dredging events. A glorious sunset was the backdrop for this momentous occasion. Too bad there were no scallops in the dredge. We did, however collect many scallops of different sizes throughout our watch. The fog that was present for most of our dredging days finally burned off to reveal calm seas and a blue sky. The watch team that I was a member of worked like a well-oiled machine. Each member had a specific task to complete to carefully collect scientific data from each dredge event. Science is messy work and handling different species is not for sissies. 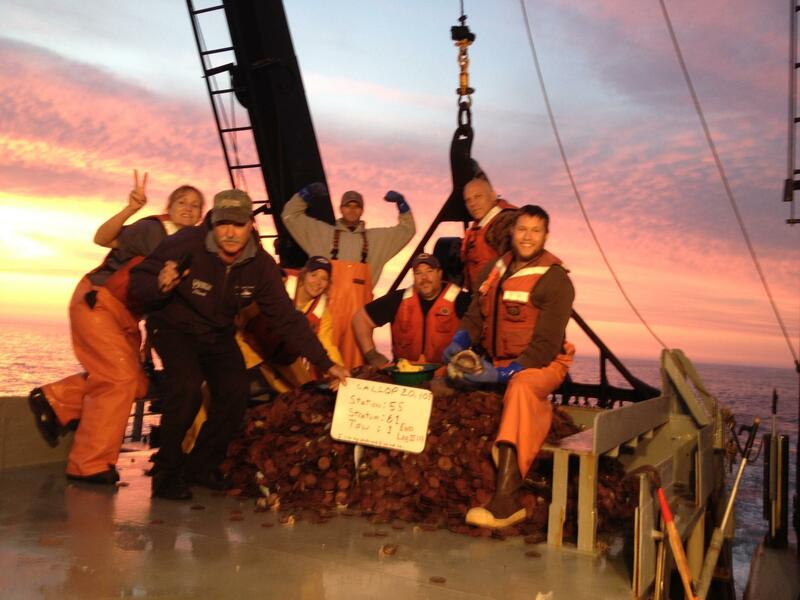 The research team and crew members gather to shuck scallops. Another spectacular sunset aboard the RV Sharp. I look forward to returning home to be with my family and friends. The life of a sailor/scientist was an incredible experience and I am excited to share all that I have learned with my students at West Genesee. Many thanks go out to the Captain and crew of the R/V Sharp and the NOAA science staff for making my journey unforgettable. The final dredge for the third leg of the scallop survey 2014. The following quote sums up my experience as part of the Teacher at Sea program. 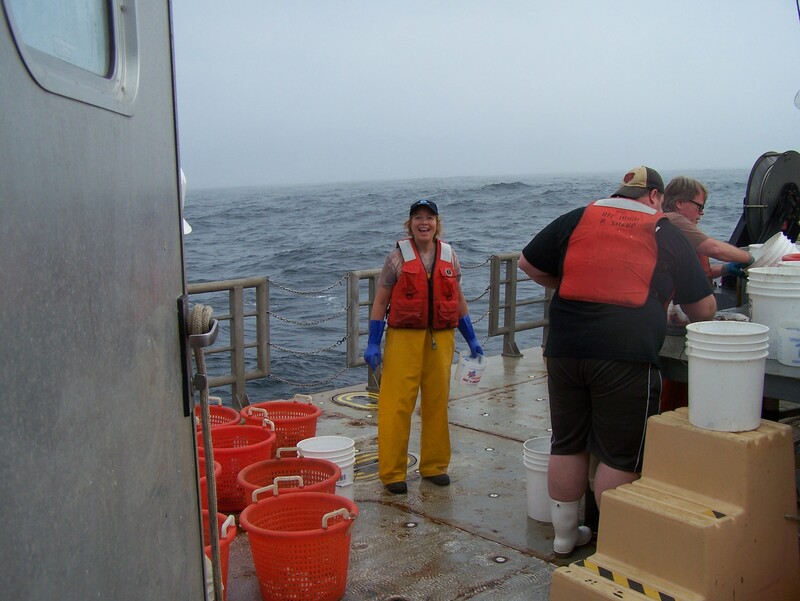 This entry was posted in 2014, Carol Glor, NOAA Fisheries Service, NOAA Teacher at Sea and tagged dredge, flounder, Hugh R. Sharp, scallops. Bookmark the permalink.